In this tutorial we will show you how you can track your visitor's reader interactions with your online PDF documents when using FlowPaper. 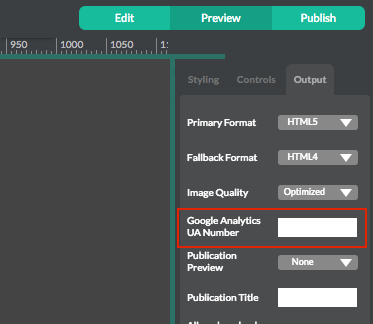 Once you have your Google Analytics tracking code, you can copy and paste the tracking code into FlowPaper Desktop Publishers "Publishing Settings" in the Google Analytics UA number. When you are done with all other settings for your document click publish and view button, upload your content to your web content. 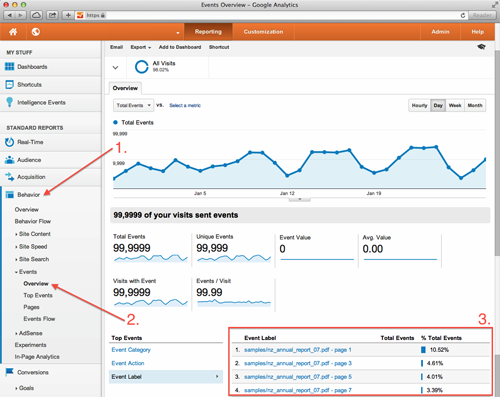 To access your statistics log in to your Google Analytics account and select the behavior section. Then select events as seen on the example image number 1 and 2. You can choose to view the analytics by category, action or lable. In this example we have selected to view the information by label as this also shows how many times each page in the PDF document has been viewed. You can see the page views in the screen shot example above marked with 3.